Joan River Robin Williams on the Edge, Reminder Joan River Howard Stern Interview Jerry Lewis Wanted Joan Dead? 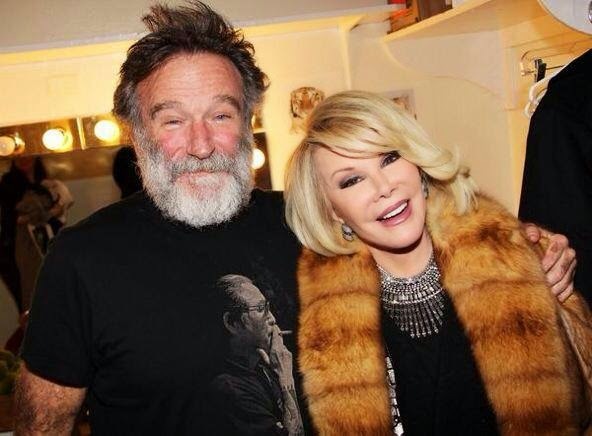 Joan Rivers said Robin Williams was brilliant...well it takes one to know one. In an industry where it is almost in possible to make it Joan kept making it and making it giving a new meaning to an enduring presence. Howard Stern has some amazing interviews with her the most disturbing when Jerry Lewis threatened her life. She could really piss people off. I'm so saddened by the death of Robin Williams. He was an amazing talent, a giving man, a brilliant comedian and an extraordinary actor. Robin genuinely made me laugh and was one of the "good guys." I’ll miss him and his wonderful spirit. KKK Ray Kelly Corrupt and Andy Cuomo Called Coward for Not Debating Teachout? NYPD Commissioner Bill Bratton made $1.35M last year is He Networking FirstNet in Case He is Fired???? Word on the street Cuomo is been called a coward by New Yorkers who want change. Michael Lawler, the manager for Republican Rob Astorino’s gubernatorial campaign, has sent his counterpart, Joe Percoco, a letter formally requesting debates. “When asked about debates recently, the Governor stated that he will “leave that to the campaigns to work through and my campaign will be talking to my rivals’ campaigns and they’ll figure it out, I’m sure.” Based on his comments, I wanted to reach out to you directly and get the ball rolling. Several weeks ago, County Executive Astorino proposed that he and Governor Cuomo do a series of eight regional debates so that they may discuss the issues not only affecting New York State as a whole, but issues unique to the voters in each region. That offer still stands. The letter comes after Cuomo, along with his running mate, former Rep. Kathy Hochul, were invited to a televised debate by Time Warner Cable News and NY1 with their primary opponents, Zephyr Teachout and Tim Wu. Neither Cuomo or Hochul committed to the debate invitations. Cuomo debated in 2010 alongside a host of candidates in an event that devolved into a circus-like atomsphere. Astorino has said he does not want a debate that includes multiple candidates, just a one-on-one forum with him and Cuomo. NYPD Corrupt Bill Bratton to Be Fired When? #NYPD Mayor de Blasio Looking for New Police Commissioner? My opinion anyone hiring KKK Ray wants fixing and favors... My opinion that's how the doctor who did not fire his violent lying employee Delita Hooks did it - he called 1800 NYPD fix it. Police are out of control violent, lying even in police reports and Internal Affairs fixing. The new police commissioner would have to come in pretty much tear internal affairs Bureau part because it's over complicated hunk of junk just like 911 tech corruption. Is Bill Deblasio looking for new police Commissioner? 2 corrupt police administration's Ray Kelly, Bill Bratton my attacker a violent liar has yet to be arrested. The dirty corrupt police department did Dr Fagelmam a favor since he didn't fire his violent line receptionist. Anything else she's lied about? Anything else she's done the doctor Fagelman turned a blind eye to? Anything he's done that require blind eye? People are asking me who did Dr Andrew Fagelman call inside the NYPD to get fixing and favors?